Carcinus maenas has a roughly hexagonal or fan-shaped shell with five teeth or blunt spines along the edge of the shell behind the eye. The first of these teeth forms the hind margin of the eye socket, and the fifth is at the widest part of the shell. No other crab found on Pacific Coast shores has five teeth on the edge of the shell behind each eye. Carcinus maenas also has three rounded teeth or lobes between its eyes, and somewhat flattened rear legs. The largest crabs have a shell that measures about 90 mm wide, and only slightly less from front to back. Freshly molted Carcinus maenas tend to be bright or dark green on top, as their common name implies, and yellowish on their underside; but over the molt cycle their color changes to a dark, mottled orange above and orange or partly red underneath, until it's time to molt again. The top surface of the shell is often irregularly blotched with dark areas, sometimes an arc of white spots, opening rearward, on either side of the midline. A few other crab species have similar arcs of white spots. 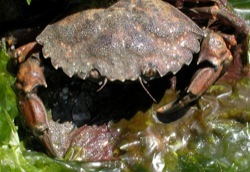 In different parts of the world, Carcinus maenas has become common in virtually all types of protected and semi-protected marine and estuarine habitats, including habitats with mud, sand or rock substrates, in eelgrass beds and in salt marshes, and has been collected from the high intertidal zone to 60 m depth. For at least short periods of time, it can tolerate salinities from 4-54 ppt and temperatures from near freezing to about 33° C. It reproduces in salinities of 13-53 ppt and temperatures up to around 18-26° C.
Mating generally takes place between spring and fall, though timing varies. A male crab mates with a smaller female, holding her underneath him and carrying her around until she molts, after which she turns over and they mate. The female extrudes the eggs in a mass that she carries under her abdomen. In favorable conditions, a large female can spawn up to 200,000 eggs at a time. The eggs can develop successfully at salinities of 26-39 ppt and temperatures of 11-25° C. Egg-bearing females are mainly found from winter to spring or early summer, though they often migrate to deeper water in winter. The larvae that hatch from the eggs drift in the plankton for a few weeks to months, depending on the water temperature (laboratory records range from 17 days at 25° C to 80 days at 12° C), molting through several larval stages. Some evidence suggests that they use tidal currents to transport themselves away from shore when young and back to shore when nearing the end of larval development. The larvae then metamorphose into small juvenile crabs that settle to the bottom. Growth rates for Carcinus maenas vary greatly in different parts of the world. This may be due in large part to temperature differences, since the crabs don't feed when tempertures drop below 7° C, and cannot molt in temperatures below 10° C. They mature at <1 to 3 years and live 3-6 years. The crabs sometimes occur at very high densities. In Europe, newly-settled Carcinus maenas have been found at densities of up to 2,000 crabs per square meter, and adult crabs at up to 20 crabs per square meter, and surveys in South Africa in 1988 and 1990 estimated densities of 3-7 crabs per square meter. In Maine and Connecticut, peak catches have been reported at about 1,000 crabs per trap per day. In Passamaquoddy Bay in Nova Scotia, 15,000 crabs were taken in two traps in 24 days. Numbers on the Pacific Coast have not been as large. Where populations have built up in shallow lagoons in San Francisco Bay, there have been a few reports of hundreds of Carcinus maenas captured per trap per day, but this is not representative of general trapping in the bay or elsewhere on the coast. At different Pacific coast sites, mean yields ranged from 0.06-1.5 crabs per trap per day, and densities at the densest sites in Bodega Harbor were estimated at 0.04-0.3 crabs per square meter (Grosholz et al. 2000). 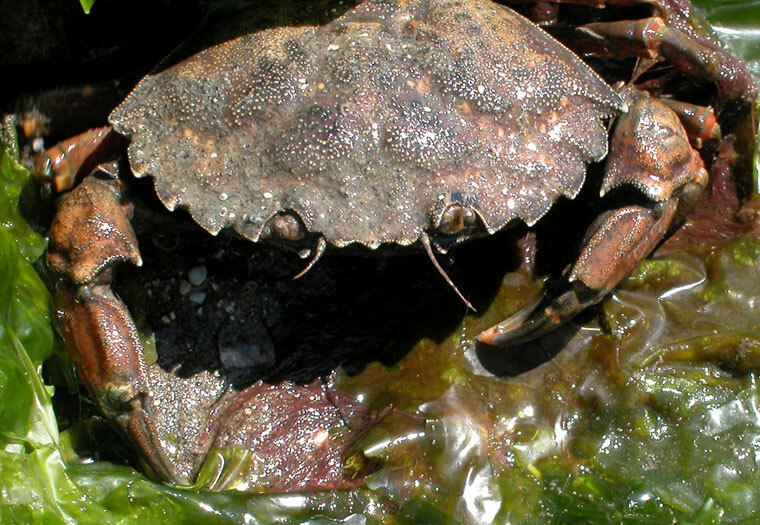 Various researchers have suggested that predation by native crabs in the genus Cancer, or predation by sea otters in Elkhorn Slough, may be keeping Carcinus maenas populations low. In field observations or laboratory experiments, Carcinus maenas has consumed an impressive variety of prey items including organisms from at least 104 families and 158 genera in 5 plant and protist and 14 animal phyla. At different locations, dominant prey have included mussels, clams, snails, polychaetes, crabs, isopods, barnacles and algae (Cohen et al. 1995). In parts of Europe, Carcinus maenas has controlled the distribution and abundance of blue mussels (Mytilus edulis), dogwhelks (Nucella lapillus) and cockles (Cerastoderma edule), and in Bodega Harbor it significantly reduced the density of small clams (Nutricola spp.) and shore crabs (Hemigrapsus oregonensis) (Grosholz et al. 2000). In New England, predation by Carcinus maenas has changed the shapes of some snail shells (Vermeij 1982). Attaining a large enough size may protect some shellfish species. 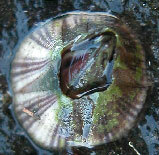 For example, it is thought that in the field Carcinus maenas rarely eats oysters that are over 60 mm long or mussels over 45 mm long, although in the lab it eats mussels and soft-shell clams that are as long as its shell width, and hard-shell clams and snails that are more than half its shell width. When searching for prey, Carcinus maenas can dig about 15 cm down in sand or mud, and this disturbance can affect the populations of small organisms living in the sediment. Carcinus maenas can also increase the populations of some species by eating their predators or competitors. Carcinus maenas has been blamed for the destruction of soft-shell clam (Mya arenaria) fisheries in New England and Canada in the 1950s, where control efforts including fencing, trapping and poisoning had limited success; and it has at times been a pest of cultivated Manila clams (Venerupis philippinarum) in Tomales and Humboldt bays. 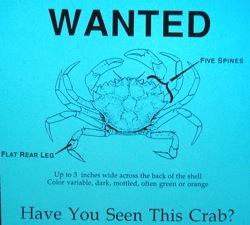 There are also concerns that it might harm Dungeness crab (Cancer magister) fisheries by preying on juvenile crabs. By entering and filling traps, it has sometimes been a pest of trap fisheries for eels in eastern Canada and for bait fish (gobies and sculpin) in San Francisco Bay. Due to concerns over potential impacts to fisheries, the Washington Department of Fish and Wildlife has listed Carcinus maenas as a deleterious exotic species, prohibited the possession or transportation of live crabs, restricted imports of shellfish seed from out-of-state waters infested with Carcinus maenas, and restricted the transfer of shells, shellfish and aquaculture equipment from Willapa Bay or Grays Harbor to other Washington waters. In parts of Europe, Carcinus maenas is harvested for food markets despite its relatively small size, and it is commercially harvested for bait in Europe and sometimes in the eastern United States. Carcinus maenas is very similar to its close relative, Carcinus aestuarii. The most consistent apparent difference is the shape of the male pleopods, which are paired appendages found under the male's abdominal flap. In Carcinus maenas the two pleopods curve outward, touching each other in the central part of the curve; in Carcinus aestuarii the pleopods are straight and parallel and do not touch. In addition, Carcinus maenas is slightly wider in shape than Carcinus aestuarii, and the front part of the carapace between the eye sockets protrudes forward more in Carcinus aestuarii (for a more complete discussion, see Yamada & Hauck 2001). Carcinus aestuarii is native to the Mediterranean Sea; and as noted below, is apparently now present, at least in hybrid form, in Japan and South Africa. It has not been reported in North America. 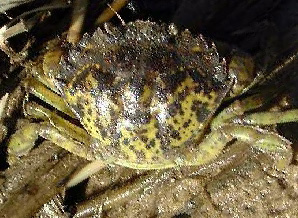 Carcinus maenas can be distinguished from all other shallow water crabs on the Pacific Coast by its general hexagonal or fan shape, and the five prominent teeth on the edge of the shell behind each eye. Atlantic coast of Europe and Great Britain north to Iceland, the North Sea, and Norway to just north of 70° N latitude; and south to Spain, Portugal, Morocco and the northern border of Mauritania. A closely related species, Carcinus aestuarii, is found in the Mediterranean. 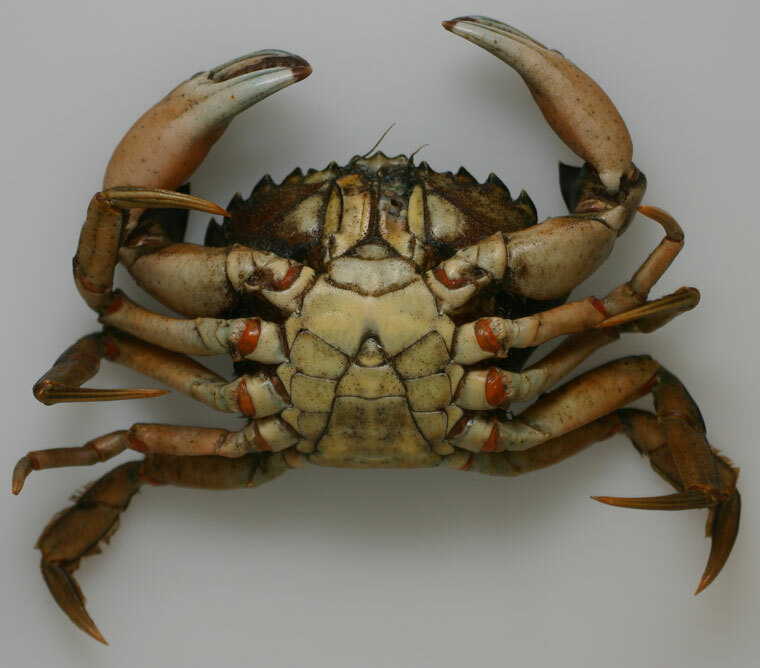 In San Francisco Bay Carcinus maenas has been collected from Benicia in the Carquinez Strait area and in Mare Island Strait to south of the Dumbarton Bridge. At times it has been locally abundant in lagoons and backwaters, but it has never been generally abundant in the bay and is often uncommon. The greatest densities reported for the Pacific Coast, in Bodega Harbor, are modest compared to large populations reported in parts of Europe, eastern North America and elsewhere. Less than 1,000 crabs have been trapped in Willapa Bay since its discovery there in 1998, and the population may be dying out. The population in Elkhorn Slough has persisted since 1994 but remains small. In most of the other bays listed above, no more than a few hundred crabs been trapped; and although some reproduction appears to have occurred in them and the populations have persisted over a few years, it's not clear that the populations are stable. Carcinus maenas was collected but is apparently not established in Clayoquot Sound [collected in 2000], Barkley Sound [collected in 1999] and Esquimalt Harbor [collected in 1999] in British Columbia; Salmon River estuary [collected in 1998], Siletz Bay [collected in 1998], Alsea Bay [collected in 1998], Umpqua Bay [collected in 1999] and Coquille Bay [a molt collected in 1997] in Oregon; and Estero Americano [one crab collected in 1989] and Morro Bay [one crab collected in 1998] in California. A report of Carcinus maenas collected in Willapa Bay, Washington in 1961 (Ricketts et al. 1962), which has been repeated in subsequent literature and on many websites, remains unconfirmed and is probably an error; as is a report of its presence in Willapa Bay in the 1930s (Niesen 1997). The earliest confirmed record from Willapa Bay is in June, 1998. 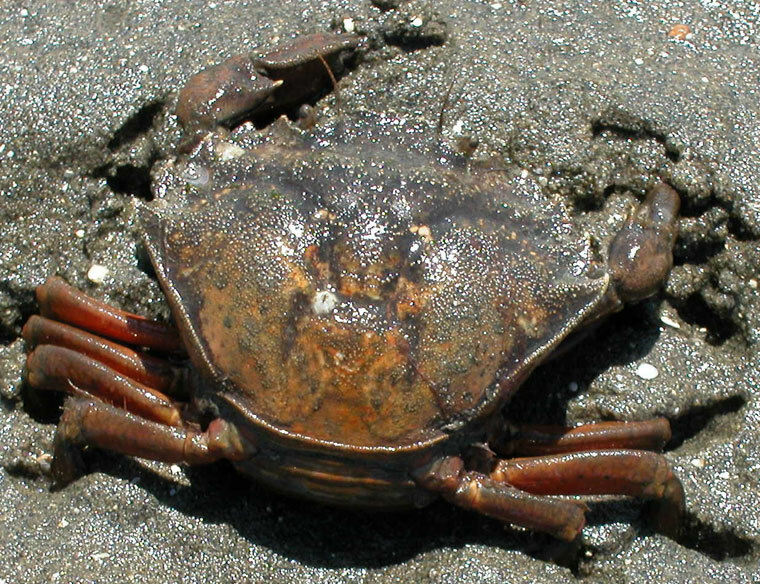 Based on indications that Carcinus maenas' range limits may be set equatorward by high summer water temperatures that prevent successful reproduction, and poleward by low winter water temperatures causing substantial mortality, Carlton and Cohen (2003) concluded that its potential range on the Pacific Coast is from north of the Aleutian Peninsula to around Magdalena Island in Baja California. Carcinus maenas as yet occupies only about the middle third of this latitude range. Carcinus maenas was first collected in California in the Estero Americano in Solano County in 1989 and at Redwood Shores Lagoon in San Francisco Bay in 1989 or 1990. Genetic analysis of crabs from Bodega Harbor indicates that they were probably introduced from the northwestern Atlantic, rather than from Europe or one of the other areas where they are found. 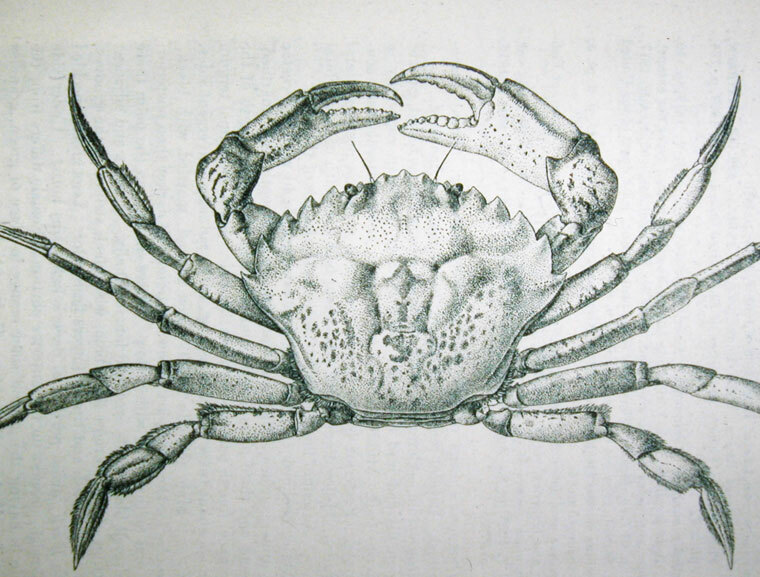 The crabs were probably introduced in the algae used to pack shipments of live New England baitworms (Nereis virens and Glycera dibranchiata), based on the collection of live Carcinus maenas from these shipments and the earliest records of Carcinus maenas being in water bodies where New England baitworms are used, but which are probably not subject to other potential vectors including ballast water discharges, the discarding of algae used as packing for shipments of live New England lobsters (Homarus americanus), and the release or discarding of research organisms. Established on the Atlantic coast of North America [reported in 1817] from Prince Edward Island to New Jersey, where it is now one of the most common intertidal and nearshore crabs, with occasional records but no established populations south to Virginia. In southern Australia [abundant in Port Phillip Bay in 1900] from southern New South Wales to near Adelaide, and in northern and western Tasmania [collected in 1993]; with a single specimen collected at Perth in Western Australia in 1965, where it is not established. In South Africa [collected in 1983] mainly near Cape Town, with one pair collected at Saldanha Bay in 1990; though these specimens resemble Carcinus maenas, genetic analysis indicates that genes of both Carcinus maenas and Carcinus aestuarii are present. 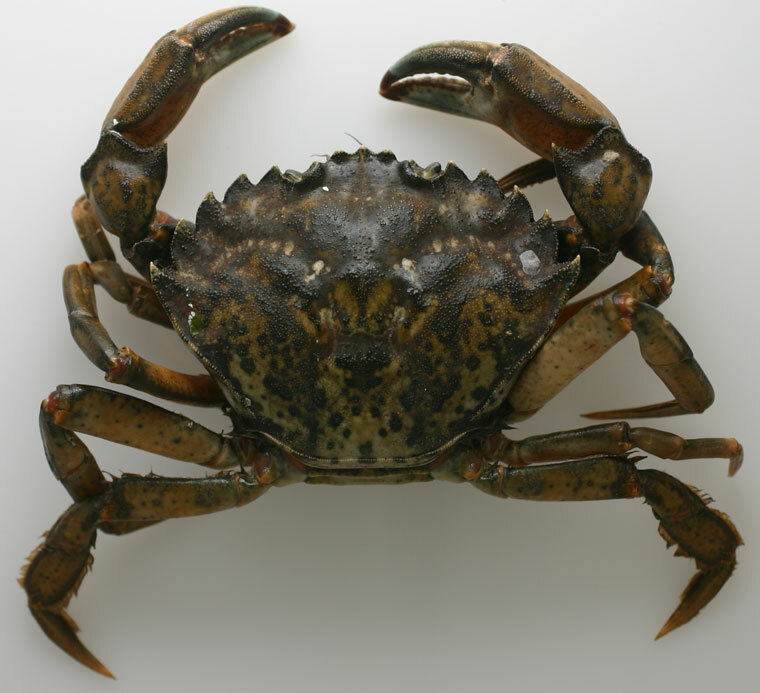 In Japan, where it was collected in Tokyo Bay in 1984 and later in Sagami, Osaka and Dokai bays; specimens here resemble Carcinus aestuarii, but genetic analysis indicates that genes of both Carcinus aestuarii and Carcinus maenas are present. In Argentina [collected in 2003]. Carcinus maenas has also been collected, as one or a few specimens, at several, primarily tropical locations where it is not established: in the Red Sea [reported in 1817], at Rio de Janeiro in Brazil [collected in 1857], Bay of Panama [1 crab collected in 1866], Sri Lanka [1 crab collected in 1866 or 1867], Hawaiian Islands [1 crab collected in 1873], off Pernambuco in Brazil [reported in 1899], Madagascar [3 crabs collected in 1922], Myanmar [4 crabs collected in 1933] and Pakistan [1 crab collected in 1971] (Carlton & Cohen 2003). Much of Carcinus maenas' early travels around the globe probably occurred either nestled among dense growths of barnacles, mussels, sponges, seaweeds and sea squirts on the hulls of ships, in cavities cut into wooden hulls by wood-boring shipworms and crustaceans, or among rocks and mud loaded for solid ballast. In recent years it could have been carried as larvae or small crabs in ballast water tanks or in other parts of ships' seawater systems; accidentally shipped with other live marine organisms intended for aquaculture facilities and food markets; or escaped or released from aquaria at educational or research institutions. Le Roux et al. (1990) suggested that Carcinus maenas arrived in South Africa on a semi-submersible exploratory drilling vessel. Carlton, J.T. and A.N. Cohen. 2003. Episodic global dispersal in shallow water marine organisms: the case history of the European shore crabs Carcinus maenas and Carcinus aestuarii, Journal of Biogeography 30: 1809-1820. Cohen, A.N. and J.T. Carlton. 1995. Nonindigenous Aquatic Species in a United States Estuary: A Case Study of the Biological Invasions of the San Francisco Bay and Delta. U.S. Fish and Wildlife Service, Washington, DC (pp. 94-95). Cohen, A.N., Carlton, J.T. and M. Fountain. 1995. Introduction, dispersal and potential impacts of the green crab Carcinus maenas in San Francisco Bay, California. Marine Biology122: 225-237. Grosholz, E.D., G.M. Ruiz, C.A. Dean, K.A. Shirley, J.L. Maron and P.G. Connors. 2000. The impacts of a nonindigenous marine predator in a California Bay. Ecology 81(5): 1206-1224. LeRoux, P.J., G.M. Branch, and M.A.P. Joska. 1990. On the distribution, diet and possible impact of the invasive European shore crab Carcinus maenas (L.) along the South African Coast. South Africa Journal of Marine Science 9: 85-93. Miller, T.W. 1996. First record of the green crab, Carcinus maenas, in Humboldt Bay, California. California Fish and Game 82: 93-96. Ricketts, E.F., J. Calvin and J.W. Hedgpeth. 1962. Between Pacific Tides. Third Edition, Revised. Stanford University Press, Stanford, CA. Vermeij, G.J. 1982. Phenotypic evolution in a poorly dispersing snail after arrival of a predator. Nature 299: 149-150. Yamada, S.B. and L. Hauck. 2001. Field identification of the European green crab species: Carcinus maenas and Carcinus aestuarii. Journal of Shellfish Research 20(3): 905-912. Yamada, S.B., B.R. Dumbauld, A. Kalin, C.E. Hunt, R. Figlar-Barnes and A. Randall. 2005. Growth and persistence of a recent invader Carcinus maenas in estuaries of the northeastern Pacific. Biological Invasions 7: 309-321. 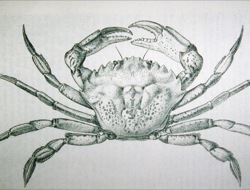 Carcinus maenas collected at Wood’s Hole, Massachusetts in 1882, drawn by J.H. Emerton. A male Carcinus maenas from San Francisco Bay. Note the shape of the carapace with 5 spines along the edge between the eye socket and the widest point of the carapace, the 3 rounded projections between the eyes, the 2 arcs of white spots on the back, and the somewhat flattened rear legs. Underside of the same specimen. 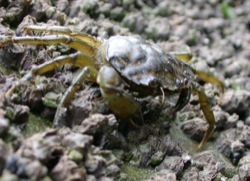 A young Carcinus maenas with a yellowish-green shell, in a salt pond on Long Island, New York. A young (probably first year) Carcinus maenas with a green shell, in San Francisco Bay. A large male Carcinus maenas with an orange shell. Found at low tide in a flooded pit dug by a bat ray (Mylobatus californicus) on the eastern shore of San Francisco Bay. A large male Carcinus maenas with an orange shell. Found underneath a seaweed-covered rock in San Francisco Bay. 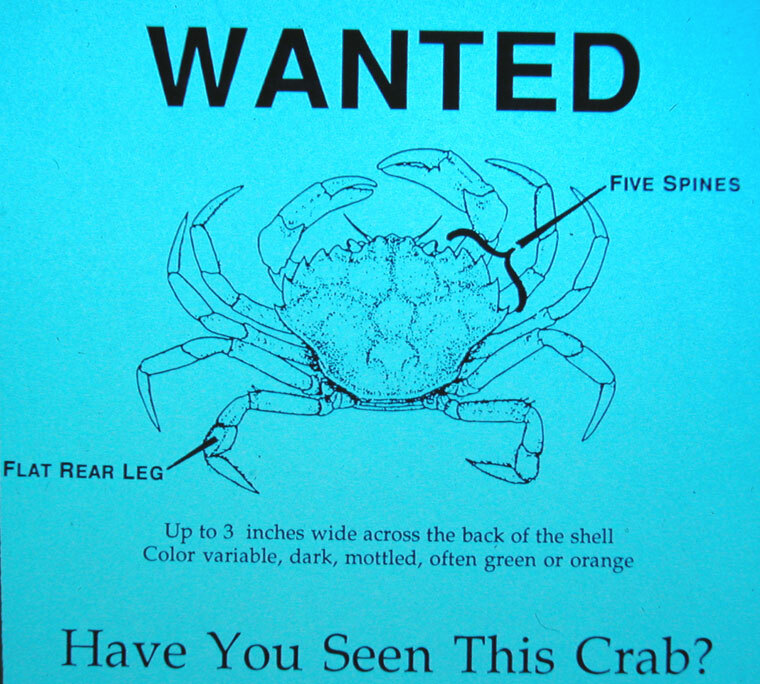 A poster used to track the spread of Carcinus maenas on the Pacific Coast.